Home / Make the billing process simple! As a service bureau we always pursue satisfaction of our clients and we are ready to find a way to cooperate. One of these ways is EHR-PMBOS integration. What does it mean? Your superbills can be imported right from your EHR to the billing software PMBOS. This means the claims will be sent faster and faster you will get your payment! Another way is a transition from previous EHR to iSmart EHR. And the meaning of this is obvious – whenever you don’t feel okay with your current EHR or it does not have necessary options or the cost does not worth it – you are always free to change your Electronic Health Records tool. 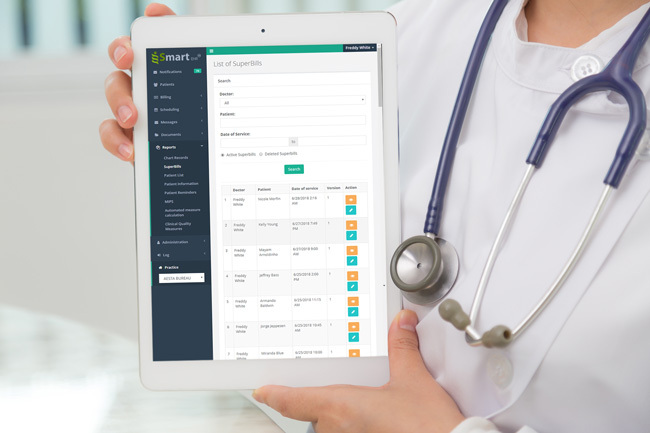 When you have decided to switch to iSmart EHR we are here to help you in transition process. Imported superbills mean you will get your money faster! Well, yes – the process of implementation of billing import or transition process it is a pain. Your staff is not very happy with the changes, the workflow goes into mess, technical issues appears unexpectedly and so on. But the good thing is that we have experience of doing it. As they say – a danger foreseen is a danger avoided. And have you ever met people who love to solve riddles? Our IT department consist of that kind of people. Just let them to solve your riddle! Now, what are the main issues here? The main issue is that every EHR vendor has its own insurance list and it’s take time to create links between client’s insurance list and vendor’s. Also sometimes EHR vendor sends blank the fields, that mandatory for the claim, for example NPI of a referring provider. All work and adjustments for new vendors, not integrated before will take up to 30 days. For already integrated it will take approximately a week. Our methods and solutions are quite flexible, extra time usually needed when new solutions/methods need to be developed. All data is being transferred through secure encrypted channel. And back up maintenance organized and being maintained according to 45 CFR Standard 164.308 Administrative Safeguards-(a), (7) - Contingency Plan. So your data is safe. We have successfully completed work on many projects, recently integrated import of billing from WebPT, Tracknet and eClinical. If you work with several EHR vendors on the same time the process of integration/transition is not a problem at all. Feel free to contact us about this!